Ingredients: sugar, cocoa butter, whole milk powder, cocoa mass, emulsifier: soy lecithin, natural vanilla. Added ingredients: glucose syrup, whole milk, cream from Isigny AOC (10%), butter from Isigny AOC (3.7%), salt of Guerande, emulsifiers: rapeseed lecithin & sucrose esters of fatty acids (milk solids 22% min; cocoa solids 33% min). 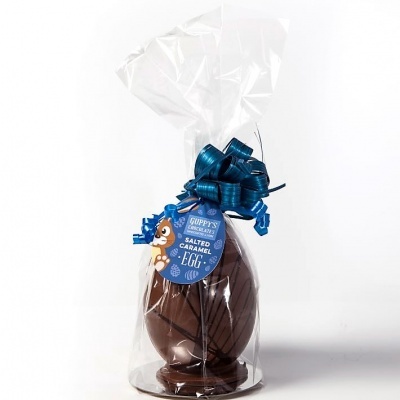 Medium easter egg handmade with milk chocolate. This egg has pieces of salted caramel flecked throughout the shell. Packaged in a clear bag with raffia bow and an easter tag to identify the flavour.